Tommy Katsiyiannis fights for loose ball. The sophomore midfielder played 76 minutes against Notre Dame. After last weekend’s loss to now-No. 14 Michigan, coach Tim Lenahan said his team needed to perform with more tenacity. Northwestern took that message to heart, coming out firing on all cylinders against No. 15 Notre Dame. But in the second half, the wheels fell off the bus and the Fighting Irish (6-3-1, 2-1-0 ACC) wore the Wildcats’ (4-5-2, 0-3-1 Big Ten) defense down, scoring three goals in the final 20 minutes of the game to win 3-0. NU’s tenacity was evident from the first whistle. Just two minutes into the match, sophomore midfielder Tommy Katsiyiannis sent a cross into the box toward sophomore forward Spencer Howard, whose shot was saved. Unlike in its last few games, NU was constantly the aggressor in the first half, moving the ball onto their attacking third and maintaining possession. In his first career start, Howard was a vital part of NU’s attack. Playing atop the formation, the California native took all three of the Cats’ shots. He said starting was something he has been looking forward to for a while, especially after redshirting with an injury last season. In the second half, Notre Dame was a completely different team. After outshooting NU, 5-2, in the first half, they consistently attacked the Cats’ defense and took 11 shots in the second half. After over 25 minutes of chippy second-half play — in which three yellow cards were distributed — the Fighting Irish finally broke through for their first goal. Notre Dame delivered a free kick toward the penalty area, the ball ricocheted and ended up by the left post, where Miskovic blocked a shot from senior midfielder Thomas Ueland. 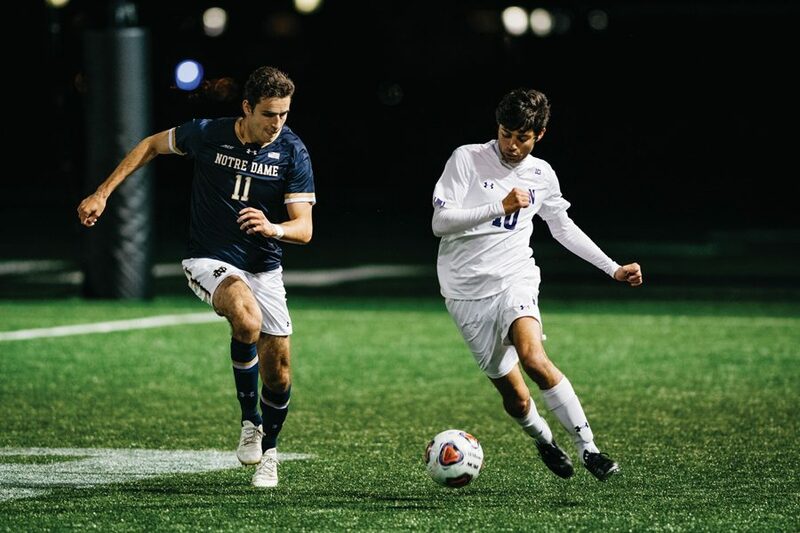 Ueland recovered and crossed the ball over Miskovic’s head to the back post where sophomore midfielder Paul Rothrock was found unguarded and tapped in Notre Dame’s first score of the game. The Cats tried to play from behind, which led to more mistakes defensively. Their inability to match up with Notre Dame’s attackers led to two more goals — one from Ian Aschieris and one from Sean MacLeod — in the span of ten minutes. Despite the score, Howard said the defense has worked hard all season and the outcome isn’t reflective of how they played overall. He added NU will take this stretch against tough opponents and carry the lessons they learned into the rest of their season.